It’s April and Esther has left New York for London, partly to escape her buckling marriage, and partly to care for her dying mother; Lonia, Esther’s mother, is haunted by memories of fleeing Czechoslovakia on the eve of World War II; Javad, their next-door neighbor and an Iranian neuroscientist, struggles to connect with his college-aged son; and Amir, Javad’s son, is seeking both identity and escape in his illicit exploration of the city’s forbidden spaces. As Esther settles into life in London, a friendship develops among them. But when terrorists attack the London transit system in July 2005, someone goes missing, and the chaos that follows both fractures the possibilities for the future, and reveals the deep fault lines of the past. 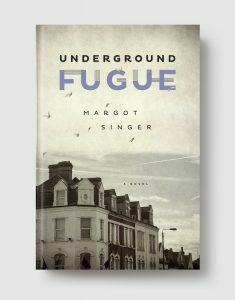 With nuanced clarity and breathtaking grandeur, Margot Singer’s Underground Fugue is an elegant, suspenseful, and deeply powerful debut. MARGOT SINGER won the Flannery O’Connor Award for Short Fiction, the Reform Judaism Prize for Jewish Fiction, the Glasgow Prize for Emerging Writers, and an Honorable Mention for the PEN/Hemingway Award for her story collection, The Pale of Settlement. Her work has been featured on NPR and in the Kenyon Review, the Gettysburg Review, Agni, and Conjunctions, among other publications. She is a professor of English at Denison University in Granville, Ohio. Winner of the Edward Lewis Wallant Award for 2017!